This slot’s theme is one were used to, but that doesn’t make it any less magical. All you have to do is read from the spell book and you could be on your way to some lucrative winnings. But don’t worry – the Alchemist is always on hand to help. However, there’s one big difference with this slot compared to other Alchemist games, and that’s the slot’s main character. The central character in this game is a beautiful blonde woman. Use her skills wisely and you may just find your fortune. That’s right – this helpful woman has the ability to turn metal into gold, now that’s a power we would all like to possess, right? Leander Games was first established in 2008, which doesn’t seem very long when you compare them with other gaming companies. But despite being fairly new to the market, they have still managed to make a name for themselves. In fact, they are considered a leading provider among avid gamers, which all comes down to their premium designs and creative gaming content. With only 30 slots, they are constantly looking at ways to increase they output with more and more titles due to be released. They have also produced mobile versions of their games, showing just how innovative they are, these include Ali Baba & the 40 Thieves and Dragon slot. While, Little Red, Megadeath, Kherpi and Supernova are among their most iconic titles. This game has a standard layout with a 5 reels, 3 rows and 30 paylines. You’ll need to start by adjusting your bets. Once you’ve done this, it is important to distinguish the game’s most valuable symbols. Amazing Alchemist’s icons come in both the traditional form along with a range of themed symbols such as an antique book and large ruby. The slot’s WILD can be identified by a potion, which can form winning combinations on its own, while replacing standard game icons. Then there’s the Free Spins symbol, which comes with great winning possibilities as it is the secret to the Spell Book Free Spins. However, the symbol will need to land on reels 1, 3 and 5 to trigger the round. The Spell Book Free Spins also comes with 3 exciting rounds. A spell book is given to you by the Alchemist and will reveal a feature when you open it. All of the features come with cash prizes as well as a host of additional functions such as WILD multipliers, WILD reels and more. 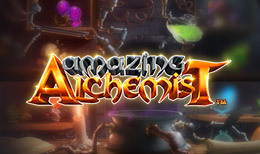 The Alchemist’s Chamber is the game’s bonus feature, and will involve picking from six ingredients. Make sure you choose wisely as your decision will result in a cash prize. Amazing Alchemist comes with a good range of features to keep even the most avid gamer up all night. WILDS, Free Spins, SCATTERS and bonus rounds are all part of the slot’s action-heavy game-play. In terms of prizes, players can win a jackpot of 10,000, which sounds even better when you take into account its RTP of 95%.